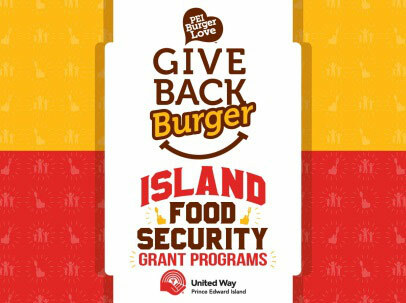 The United Way of PEI has announced funding for 3 Island Food Security Grants made possible thanks to the success of the 2018 PEI Burger Love Campaign’s “Give Back Burger” initiative. Participating restaurants donated $1 for each Give Back Burger sold in April to the United Way of PEI’s Food Security Grant program, which supports programs that increase access to local and affordable food for Islanders. The PEI School Food Project focuses on providing healthy, local meals in schools, student involvement and food education opportunities, while making sure all families can access high quality, healthy school food through a “pay-what-you-can” model. A pilot program is planned for 9 PEI schools for the fall of 2019. The Youth Mentorship Initiative works to support junior high school students from the Community of St. Peter’s Bay who are living in, or who are at risk of living in, poverty. One of the initiative’s avenues for hands-on learning will be through a garden project where participants will learn how to plant and maintain a garden, teaching them a lifelong skill and ways to use available resources to provide food security. The Nutritional Breakfast Program operates Monday-Friday from 6:30am - 8:30am year-round, providing children with a healthy, hearty breakfast, physical activity, time with friends, and homework support. Members also receive transportation to the club and school, along with healthy food for their lunches if needed.